In 2000, there were 600 million people aged 60 and over. There will be 1.2 billion by 2025 and 2 billion by 2050. Today, about two thirds of all older people live in the developing world. By 2025 it will be 75%. In the developed world, the very old (age 80+) is the fastest growing population group. Over seven thousand Americans will turn sixty each day in 2006 (about three hundred and thirty an hour). With this in mind, the United Nations Principles for Older Persons, in pursuance of the International Plan of Action on Aging, was adopted by the World Assembly on Aging and endorsed by the General Assembly in its resolution 37/51 of December 3, 1982. World governments were encouraged to incorporate the following principles into their national programs whenever possible. The principles, in brief, are the assurance of providing their aging populations with (1) Independence (2) Participation (3) Care (4) Self-fulfillment (5) Dignity. There is, indeed, a growing need to address the well-being of our aging population. The Artful Life can help fulfill this need. Marian Diamond, professor of anatomy and a foremost expert on neuroanatomy, has done extensive research on the effects of the environment on the brain. She says, “The brain is truly a phenomenal structure, and keeping it healthy for our entire existence on this earth is a goal we can and should all aspire to.” (Marian C. Diamond, “Successful Ageing of the Healthy Brain,” article presented at the Conference of the American Society on Aging and The National Council on the Aging, March 10, 2001, New Orleans, LA. First Join Conference). She advocates, five anti-aging factors significant because of recent scientific validation: Diet, Exercise, Challenge, Newness and Human Love. Planned for retirement communities and seniors in the Savannah, GA area, The Artful Life, can, having progressed successfully as a business and an educational service for a year or two, expand and franchise its programs to fill the needs of retirees, seniors and assisted living individuals nation wide. The Program is designed to be adopted to a variety of sites, locations, and the needs of a broad range of participants yet remain an invigorating, inspiring and satisfying experience in the lives of many. At present, there is no service that offers this creative package in any retirement communities, assisted living facilities or community colleges. 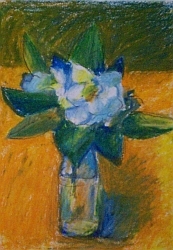 Although art classes are offered, The Artful Life presents a much broader range of educative initiatives, including large motor movement and breathing exercises at the beginning of each class session, group projects involving movement through drawing and painting with music, lectures on creative thinking and problem solving, visits to artists studios, learning the skills of critique, visits to museums and galleries and lectures on historical and contemporary art. The goal of The Artful Life Program is that through learning and experiencing the full scope of the artful life, students will enhance their physical, mental and spiritual capacities. And this leads to a healthier spirit and a longer life. The Artful Life Program will have a website that links to several other sites like New Horizons for Learning, Lifelong Learning sites, sites on retirement communities, seniors, aging, the boomer generation and lifestyles. The Program will be advertised in AARP magazine, as well as Savannah newspapers. As the Program progresses, networking with magazines, newspapers and local media will expand coverage. A large portion of the success of the Program will initially depend on word of mouth as well, expanding knowledge of the Program within the community. Research grants could help finance the Artful Life Program. The National Endowment of the Arts is already financing research on the cultural benefits to an aging population. A NEA (National Endowment for the Arts) sponsored study called, “The Impact of Professionally Conducted Cultural Programs on Older Adults.” began in 2001 and is to be repeated every two years. It proves that compared to a Control Group, and Intervention Group that participated in cultural programs had significantly better overall health, less falls and hip damage, fewer doctor’s visits, diminished use of medications, diminished visual problem and increased involvement in activities. Other areas of financial support will be investigated, including support options through state and local governments, not-for -profit grants, entrepreneurial loans and setting The Artful Life Program up under the auspices of a supportive foundation or corporation. The more support though the above venues, the less participants in the Program will need to pay. Fees and cost of courses in The Artful Life Program for individual participants will be gauged on a median income demographic. A reduction in these fees and costs would be precipitated by financial support. Enough profit must be made in order to slowly and steadily expand and enhance the Program However, students must be able to afford this service. If the cost of the Program is prohibitive, it would conflict with the mission statement of seeking to be available to the very widest range of participants. The Artful Life Program can be conducted on site in the facilities of a retirement community, churches, public or private schools, colleges, universities, YWCA’s or YMCA’s. The Program would be retrofitted for the specific location. Ideally, the Artful Life Program will be modeled on a specific site. The studio will be comprised of a separate ceramic area with kilns, potter’s wheels, shelves and work tables. The main studio will consist of work tables, easels, shelves and lockable storage spaces, drawing tables and chairs. This area will be used for printmaking, painting, drawing and design projects. Another open area with comfortable chairs set apart from the work spaces will be for discussion, critique, lectures and media presentations (films, videos, performances,etc.). Good lighting and ventilation is critical. This space will double as an exhibition area for the work of students. There will be an exterior walled garden area, easily accessible and landscaped with a garden, trees, pool and benches. This area will be used for exercise, lunch and dinner parties, meditation, drawing, sketching and painting and receptions for group exhibits. As with any public service, adequate insurance that protects both the students, teachers, facility and Program itself is necessary. The insurance should cover the specific Program facility as well as off-site course locations. Are you interested in creating an Artful Life Facility in your community? Have you created a similar program? Contact me, I welcome your comments, suggestions and information! It's never to late to do art! I've been painting with water color and then did some little cards for my twelve year old niece. Five years ago, for a small business course at a community college I developed a financial plan for "The Artful Life Program," a series of art learning classes for 55+ students. This offering of art classes could be installed in a community recreation center, a church basement, an instructor's house, or wherever people wanting to learn and do art could congregate. I had to do the financials, figure out what would be needed to teach in a facility and project an income and expense sheet for its operation. I came a way from the small business class with a good working plan for bringing art to the 55+ community. One of the classes I called "Finding The Artist Within." Based on my experience with teaching older people, the course was constructed to refresh, inspire and develop creative skills through a series of exercises. I made each project simple, fun and provocative and directed towards an end goal of helping the students choose an artful direction in painting, drawing, printmaking, or collage. Through six lessons, students could develop their imaginative, visualizing and creative skills will working on projects that were fun for the group and not intimidating. Over the years, I have taught "Finding The Artist Within," in in private classes as well as life-long learning programs. It remains today, one of the most popular class offerings I have!